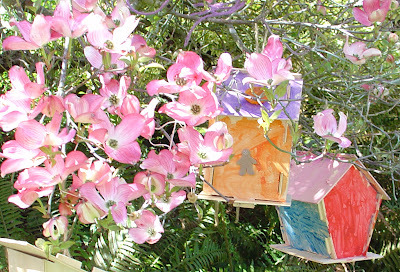 As I was wrestling with the lawnmower this afternoon, I noticed the dogwood tree had blossomed around my daughters' birdhouses. I don't know if any birds have taken residence in them but I think they look like cheery places to live. Cheery, indeed. Your dogwood is beautiful, ours froze a couple of weeks back, so we missed it all together. Thank you for sharing yours. And while I'm here, Tag! You're it. Post 7-10 random things about yourself.